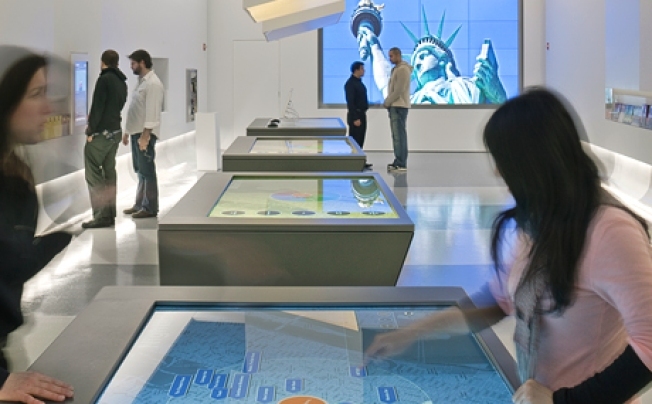 The new Information Center gives New Yorkers exciting new ways to ignore Restaurant Week. Google and New York City have teamed up to give New Yorkers yet more ways to ignore promotions like Restaurant Week and discounted tickets to "Shrek: The Musical." It's true, city-dwellers who are bored, blasé, out-of-work, or just plain apathetic can now practice indifference to prixe fix specials and the like with the aid of pointless technology. This morning GoogleBlogs has a post from Mayor Michael Bloomberg, who apparently writes exactly like an aid in the city's communications department, announcing a partnership between New York and Google to bring guests and locals superfluous gadgets. They've even opened an Information center at 810 Seventh Avenue so that people can do what they could have done in the comfort of their own homes in a government building. The biggest breakthrough is that they managed to make the center look like the police station in "Minority Report", complete with table top screens on which visitors can navigate GoogleMaps.